How to Fix Error Code 0x803f7000 in Windows 10 Store? Home »	Fix » How to Fix Error Code 0x803f7000 in Windows 10 Store? Issue: How to Fix Error Code 0x803f7000 in Windows 10 Store? 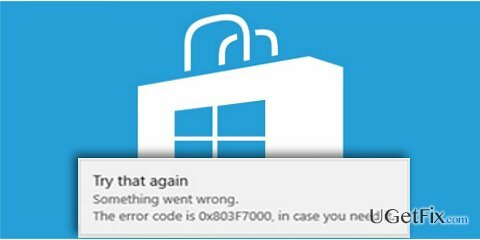 Hello, I have updated my OS from Windows 8 to Windows 10, but when I try to download apps from Windows 10 store, I get an error 0x803f7000, saying that something went wrong and that I should try again later. However, the problem persists whenever I try to download programs. Can you provide a solution? You have set your region incorrectly. Issues with Windows Store cache. There are several methods how you can fix Error Code 803f7000 in Windows 10. You can follow the instructions we provide below, or you can simply install an automatic error fix software and solve Windows 10 Store 0x803f7000 error automatically. For example, you can use RegCure Pro or SpeedyPC Pro. Go to Control Panel > Clock, Language, and Region. Click on Change Date & Time and set the right time. Again, go to Date & Time again, and navigate to Region. Set your region in Home location section. Press Windows Flag Key + X on the keyboard. When a menu appears, select Command Prompt (Admin). When Command Prompt appears, just enter wsreset and hit Enter. Wait until Windows Store opens up. This might take a couple of seconds. When Windows Store window appears, try to download your preferred app again. Either the first or the second method should fix the Error Code 0x803f7000 issue in Windows Store, just make sure you complete the steps exactly as instructed. After adjusting date&time&region settings, and also after resetting Windows Store, you should be able to download applications from the Store again. If the problem persists, it might be that Windows Store is overloaded at the time. If you still cannot fix the problem, we advise you to use an automatic tool to solve this issue, for instance, RegCure Pro or SpeedyPC Pro.